It begins again, the Marathon des Sables! 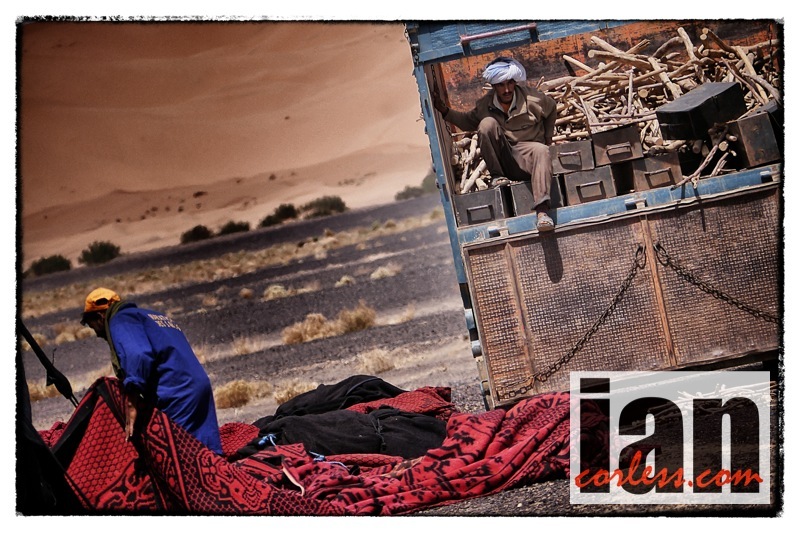 Now in its 29th year, the epic multiday race in the Sahara is considered by many the Father of stage racing. Often called ‘The Toughest Race on Earth’ we all know that it isn’t but one thing is for sure… it’s no walk in the park. 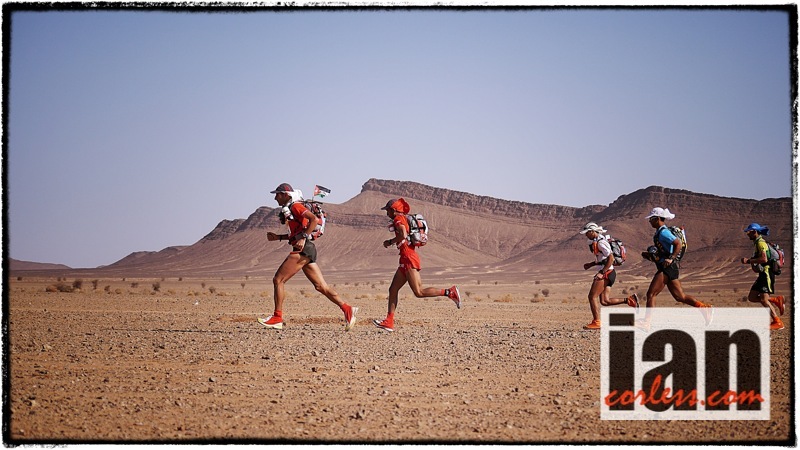 Heat, sand, survival, reduced calories and self sufficiency pushed to the limits will test each and everyone of the 1079 participants who will toe the line in South Morocco. Participants from France will represent 30% of the field and over 45 other nations make up the remaining 70% with the UK providing the largest contingent. 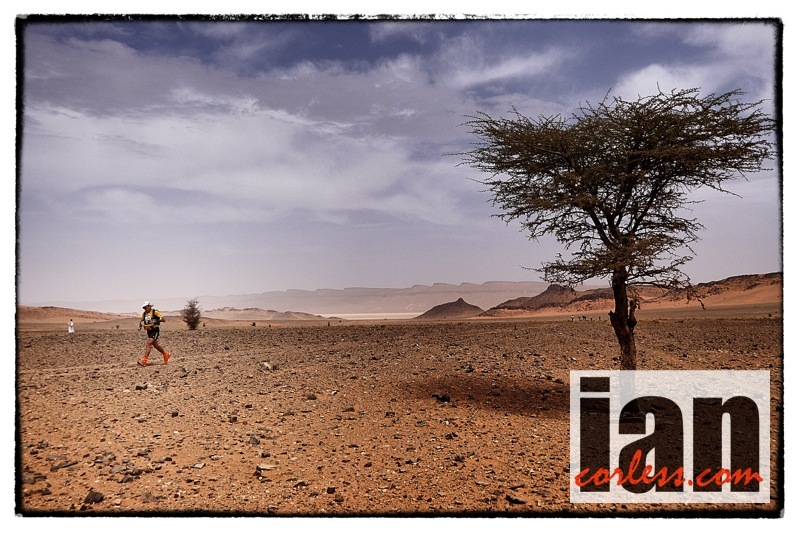 The provinces of Errachidia and Tinghrir will host the 2014 Marathon des Sables over 6-stages with a total distance of 250km’s. An easy day will be 30km and the longest day, 75km. It’s a wonderful way, albeit a tough and challenging way to embrace the Moroccan dessert. 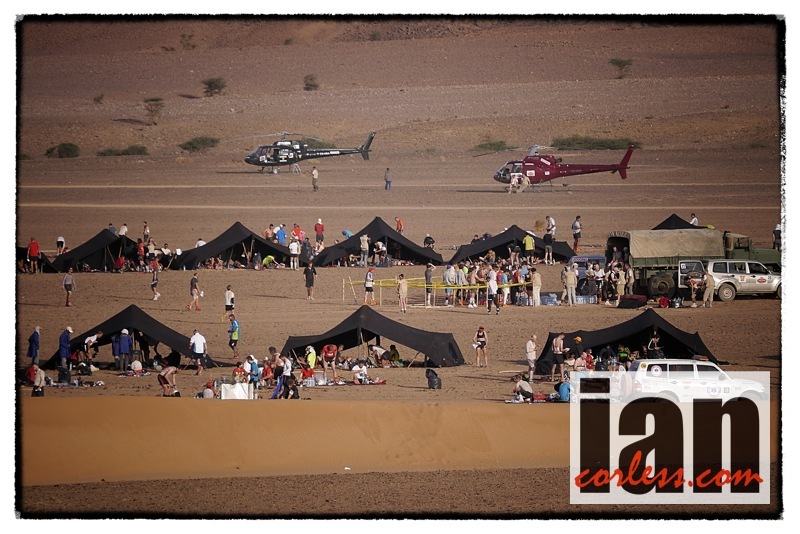 The 2013 edition of the race was noted as ‘one of the toughest’ in the races prestigious history, 2014 will be no different; traversing ergs, djebels, stony plateaus, dried-up lakes (wadis) and of course lush oasis. Occasional passing traditional villages and encampments of nomads, the 29th edition of the Marathon des Sables promises to be a ‘secret garden’ of the Sahara. Described by race founder, Patrick Bauer as ‘the greatest show on earth’, his comparisons to a circus are apt. 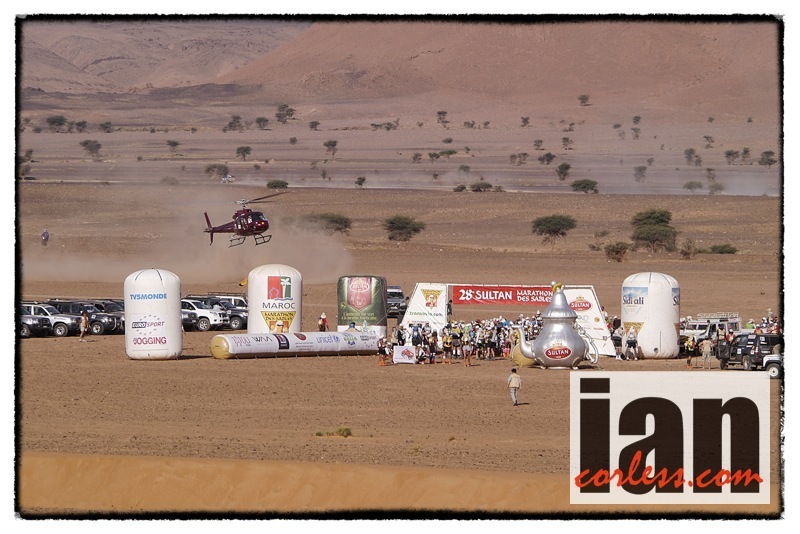 The Marathon des Sables really is a large circus like operation on a scale that is second to none. 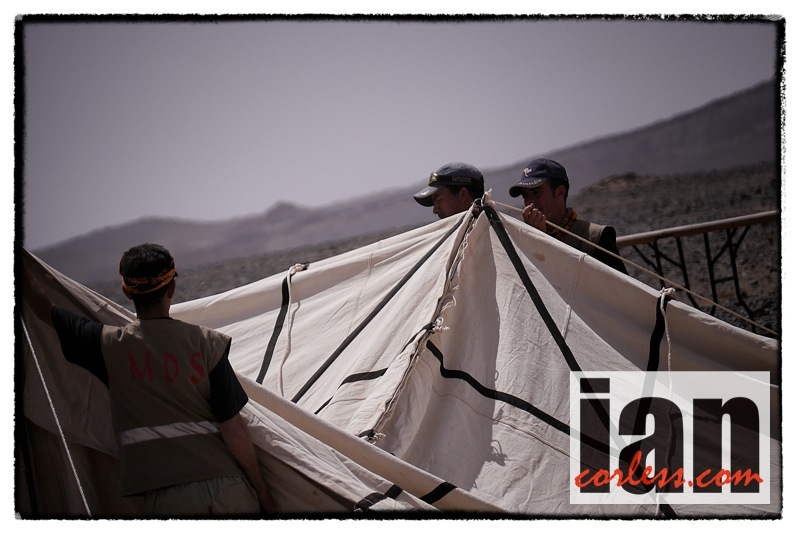 Volunteers number 130 to supervise the race, 430-general staff support the race and 300-local Berbers man the bivouac. All-terrain vehicles number 120, 8 ‘MDS’ planes, 25-buses, 4-dromederies, 1-incinerator lorry, 5-quad bikes and 2-helicopters keep the show on the road. Add to this 52-medical staff, journalists, photographers and you really have what I have come to call, the ‘Cirque de Sahara’, it’s quite special. 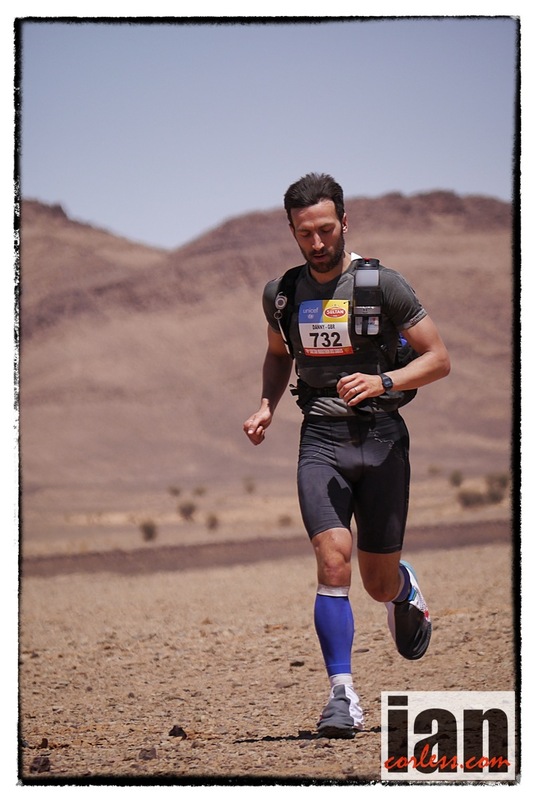 A race with a history, the Marathon des Sables dates back to 1984 when Patrick Bauer, aged 28, ventured into the Sahara to traverse solo a 350km journey with a pack weighing 35kg. It was an ultimate self-sufficient expedition that lasted 12-days. Inspired by the experience, in 1986 the first edition was created, just 23-pioneers embarked on what must have been ‘the ultimate’ expedition. Who would have thought those formative years would have laid the foundations for what is, without question, the father of multiple day racing. The race has had memorable moments; in ‘1991’ the Gulf drama had an impact on the race, ‘1994’ the arrival of Doc Trotters, ‘1995’ the 10th anniversary, ‘1996’ Mohamed Ahansal participates for the first time, ‘1997’ Lahcen Ahansal wins his first MDS one of many), ‘2000’ internet arrives in the Sahara, ‘2001’ the ‘long’ day exceeds 70km, ‘2002’ a week of sandstorms and wind, ‘2009’ flooding at the MDS, ‘2010’ the 25th edition and finally, in ‘2013’, solar energy arrives in bivouac. What does ‘2014’ hold for us…? 2013 female winner, Meghan Hicks unfortunately will not return to the Sahara this year. Meghan would have loved nothing more than to defend her title, however, Meghan has received an injury and has had no other option but to retire; a real shame. Jo Meek and Zoe Salt will not return, this leaves the floodgates open for 2011 and 2012 champion, Laurence Klein (Fra) to return and dominate the race. Laurence dropped from the 2013 edition of the race with dehydration whilst in the lead. I have no doubts, Laurence will return, 1-year wiser, 1-MDS wiser and with lessons learnt. Laurence raced at Gruissan Phoebus Taril 50km in February this year and won, in the process, she also placed 20th overall. She’s in form! Simone Kayser from Luxemburg has 3-MDS (2002, 2004 and 2005) victories and returns in 2014. With past experience, knowledge of multi-day racing and an understanding of the Sahara, Simone will also test the podium positions. However, her current form is unknown. Salameh Al Aqra and Mohamad Ahansal have battled ‘royal’ in the dunes of the Sahara for years. In 2009, Ahansal won, Al Aqra was 3rd, in 2010 it was Ahansal 1st, Al Aqra 2nd, 2011 Ahansal placed 2nd and Al Aqra 3rd, 2012 Al Aqra took honours relegating Ahansal to bridesmaid, however, last year, Ahansal once again regained his crown with Al Aqra chasing the locals heals. Both return in 2014 and based on past records you have to tip Ahansal with his 5-victories and 9-second places to dominate once again. Rachid El Moriaty won in the race in 2011 and in doing so placed Ahansal in 2nd by just 7-minutes. He’d do well to repeat that performance. Miguel Capo Soler is arguably the hot prospect to place Mohammed and Salameh under pressure, his 2013 3rd place will without doubt have ignited a fire and a desire within him to take his performance one step further and move up one notch on the podium and if all goes well, two notches to reign supreme. Miguel Heras certainly is a surprise entrant for MDS and I guess this is a significance of the *UTWT flexing its muscle and introducing runners who we would not normally see at a multi-day race. This is a good thing! 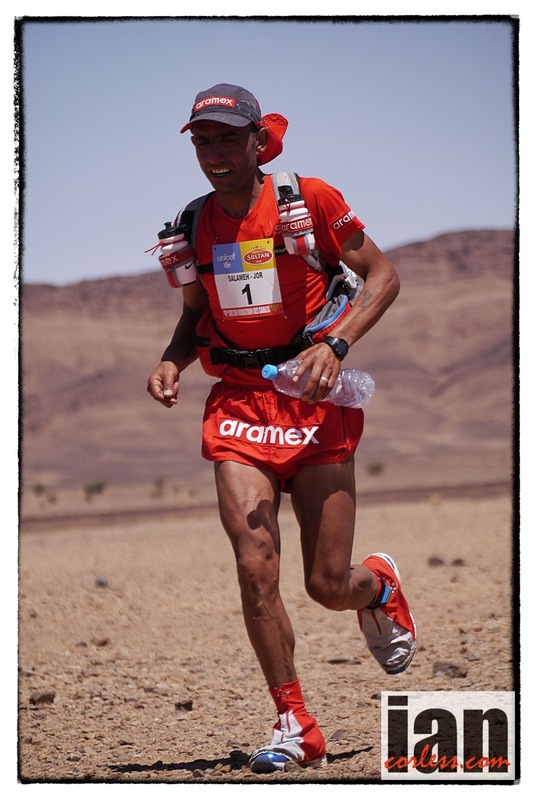 However, Miguel had to withdraw from Transgrancanaria with injury issues and I am not sure currently his status? Should he race he will without doubt bring an interesting dynamic to the race. When in form, he is world class and one of the best ultra runners in the world, Miguel has proved this time and time again and is 2nd place at the 2013 TNFUTMB proves this. I hope he’s fit, firing on all cylinders and ready to bring his ‘A’ race to the Sahara. UK hopes are in the legs and lungs of Danny Kendall. A ‘regular’ at the MDS, Danny has consistently worked hard on his training, racing strategy and in in 2013 he placed 10th overall, the best ever performance by a Brit. The podium may well be out of reach but anything higher than 9th will be something to celebrate and embrace. Cyril Cointre also takes a *UTWT place and will be a potential force at the front of the race. 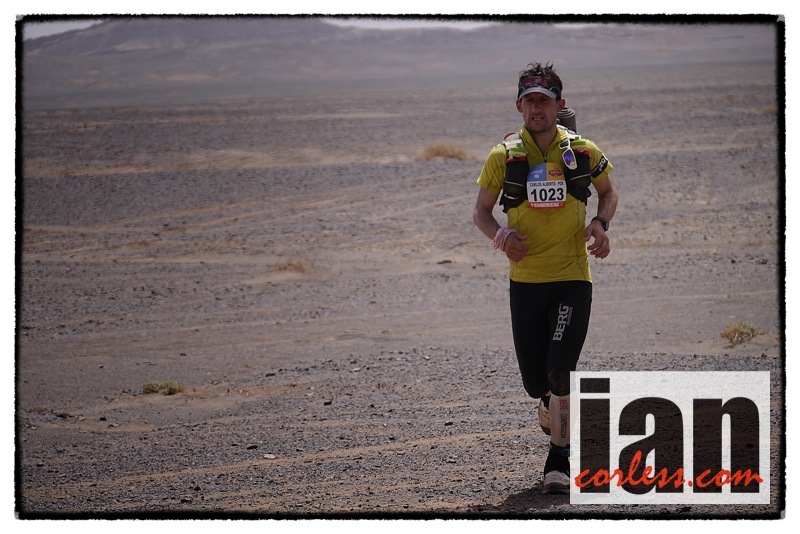 Cyril placed 8th at Transgrancanaria and 11th and HK100 in the last 2-months. Will he be recovered. Wild card may well be Abdelkader El Mouaziz who has 13 sub 2:10 marathons! 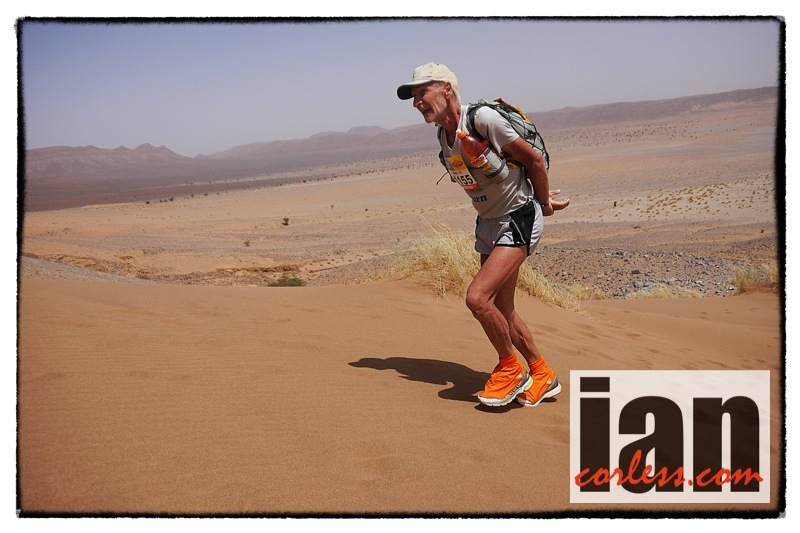 He hasn’t run the MDS before and that speed may well transfer well to the dunes and terrain of the Sahara, however, one has to wonder what if? Mouaziz won London Marathon in 1999 and 2001; in addition, he also won New York in 2000 and Madrid in 1994. He may well be nowhere near his glory days but Mouaziz is an exciting addition to the 29th edition. Anything can happen and without doubt, 2014 will throw up some surprises and names that we have never heard of before. 2013 was no different and that is what makes this sport so exciting and exhilarating. What does the 2014 course look like? We get straight to the point and attack hard with a good fifteen kilometers or so of dunes in total on this first leg. Our imagination transports us into the shoes of British explorer, Sir Wilfred Thesiger, or to the very core of superb cinema, which were a wonder to us all! This is coloured by fields of dunettes on the mountainside and a vast reg plateau, where the marathon runners will be able to really show what they’re made of at over 16km/hr. An abandoned adobe village, a dried-up lake crossing, a small erg with some beautiful dunes, an extensive plateau of black rock, the negotiation of a remote village and a djebel climb will make up the varied menu of this long second leg, where managing ones effort will take on its full meaning. 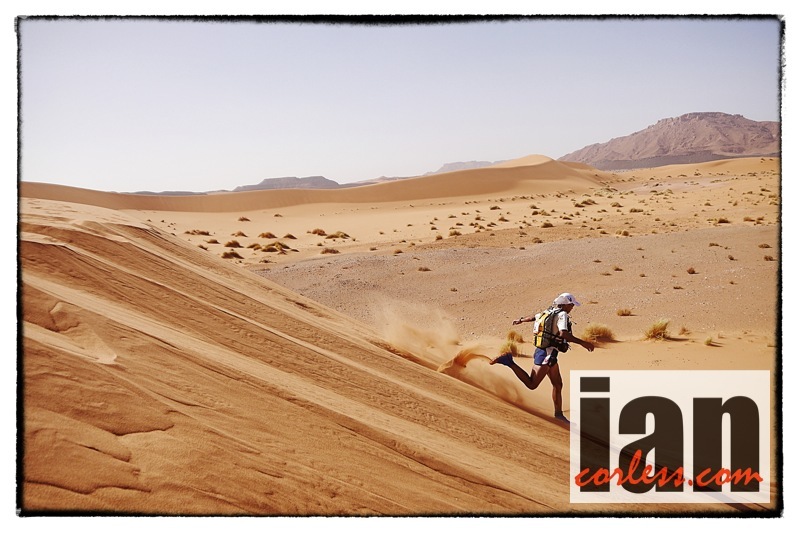 After 8km of running on fair terrain, the sand will put in an appearance again prior to a djebel ascent where a fabulous erg can be perceived at the bottom of the valley. There the runners will again negotiate some high dunes to make CP2, from where they will discover an ancient town, in ruins and perched on a hill, before making the night’s bivouac. An ultra flat plateau running along a series of dunettes will form today’s backdrop before the runners traverse a wadi and hopefully get a bird’s eye view of the desert from up high after a tough little climb of around thirty-minutes. The landscape is truly breathtaking! Once you make it to the valley, you can make out a fabulous little erg followed by vast plateaus and a succession of djebels. The images here are strikingly beautiful and herald the discovery of an impressive sandy valley. Here, a laser beam will guide runners surprised by the cover of darkness. Participants will then link onto terrain dotted with crevasses before traversing a long, winding, sandy wadi and finally the bivouac. It will be important to follow the markers! A long plateau of black reg will lead the runners into the ‘Out of Africa’ valley before they link onto a mountainous path, which will guide them to the bottom of a deep wadi. It’s a place where a number of villagers have taken up residence along this dried up river in which the palm trees are kings and agriculture is the only resource. A vast plateau peppered with dunes and dunettes will lead the competitor to the bivouac in this final timed leg. As they make for the small village that will play host to the final finish destination, the competitors, sponsors and families that form the caravan will be able to appreciate the beauty and softness of the landscape in the ambience of closeness and sharing that is synonymous with this UNICEF leg (which supports projects benefiting disadvantaged children). For the majority of participants, this walk gives them time to reflect on this beautiful human adventure and collectively realize their accomplishments before getting back to civilization. Updates will be posted daily as and when possible based on wifi connection and gps. Please be patient. I will do all I can to upload images and daily reports. *UTWT – In 2013, the event became part of the Ultra-Trail World Tour Series, which groups together the major Ultra Trail races across all the different continents. The MARATHON DES SABLES will represent Africa in this circuit, where the distance (at least 100km), the site, the participation (at least 500 at the start), the internationality (at least 20 nations) and the length of existence (at least two editions) determines which events are selected. Beyond these sporting criteria, moral and ethical values, sporting equity, respect for oneself and others, as well as a respect for the environment, must be brought to the fore. 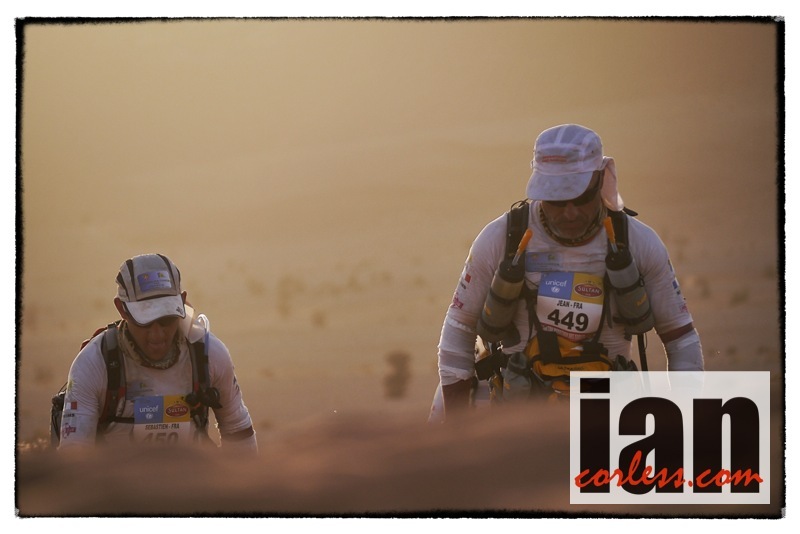 Such values have always been conveyed by the MARATHON DES SABLES. 10 races, 5 continents, 150 global elite athletes… the Ultra-Trail® World Tour 2014 draws together the superlatives to provide the biggest number of runners with a world tour of the most prestigious races off the beaten track. Indeed, through their specific features, the #UTWT races illustrate the true diversity of the trail. Their sporting formats call for participants to have a real ability to adapt. As such you need a range of very different qualities to be a contender for victory! 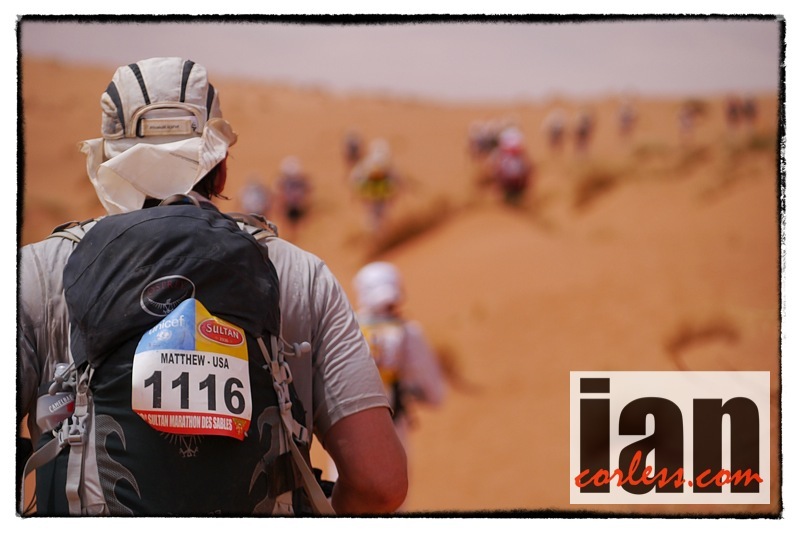 The MARATHON DES SABLES, the 4th leg of the 2014 tour, ranks among the ‘series’ races. As such, the number of points won in this event is increased, which makes it a decisive race in the bid for the #UTWT 2014 champion’s title. 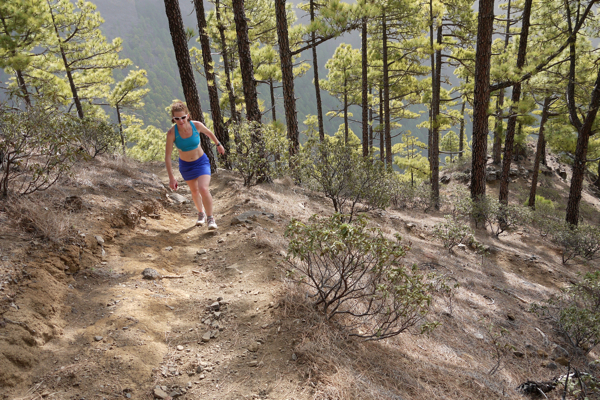 Participating in the Ultra-Trail® World Tour gives everyone a chance to discover unique cultural and sporting features. All the continents will be visited: Africa, America, Asia, Europe and Oceania. So many opportunities to enrich one’s sporting culture, to create new friendships and to feed on emotions and perhaps, one day, be a ‘finisher’ in every one of the events! 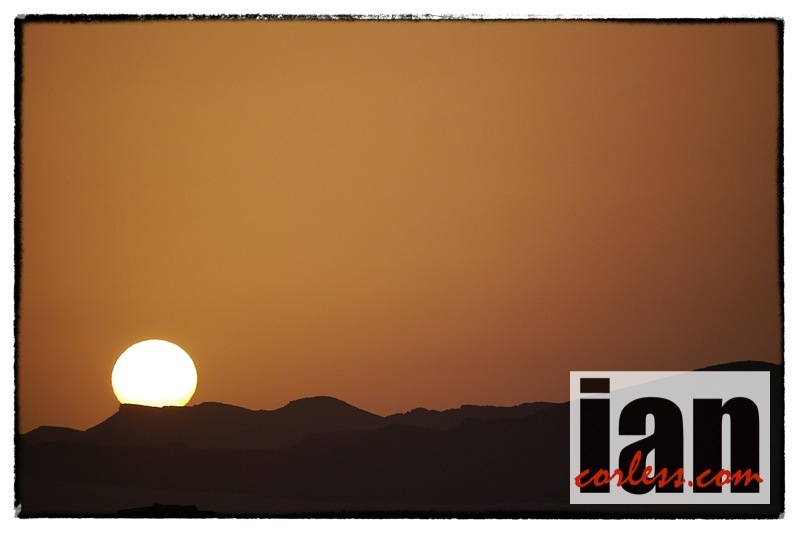 This entry was posted in Uncategorized and tagged 29th edition, Abdelkader El Mouaziz, Adidas, baue, Carlos Sa, carlossa, cointre, dannykendall, Errachidia, Heras, kendall, klein, Laurence KLEIN, marathondessables, mds14, mds2014, Miguel Capo Soler, Miguel Heras, Mohammad Ahansal, Morocco, mrs, Multi-day, Nikki Kimball, Patrick Bauer, Rachid El Moriaty, SA, sahra, Salameh AL AQRA, Salomon, Simone KAYSER, stage racing, Tinghrir, TNF, Toughest race on earth, ultratrailworldtour, UTWT, WAA by talkultra. Bookmark the permalink. 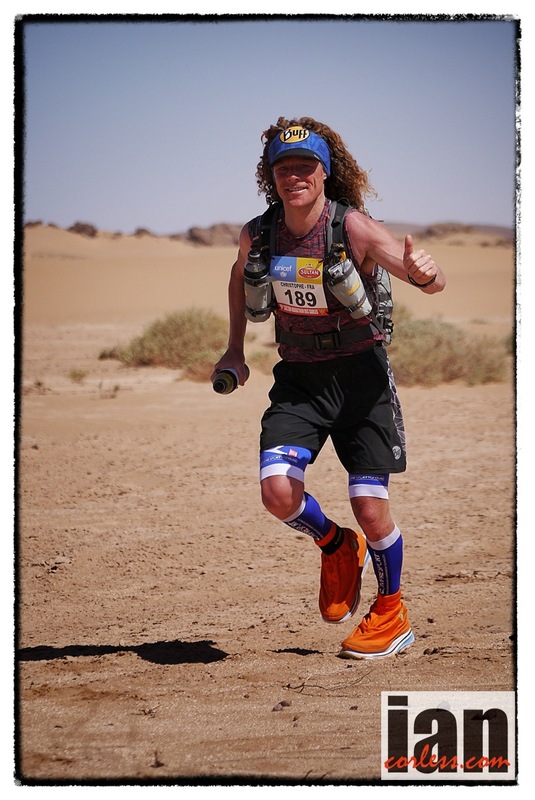 Nice article Ian, I am taking part in the MDS this year so thanks for the info. Going to be a big step up for me in terms of endurance but wanted to try and do it for years. I met you a long time ago as I am a friend of Warren Ironside. If I see you out there I’ll come and say hello. Gaz. You will see me Gary, I fly out with all the UK entrants from Gatwick and then I am working on the race as a photographer/ journalist, so make sure you come find me. Will do Ian, nervous but looking forward to it.